Live from the Investiture of the Rt. Rev’d John Guernsey as the first bishop of the ACNA Diocese of the Mid-Atlantic at Truro Church, Fairfax, VA.
Bishop John Guernsey and his wife, the Rev'd Meg Guernsey. The service began with a joyous celebration of hymns and songs led by a joint choir made up of members of the new diocese. People are not phoning in their singing, any minute now the roof could pop off. This is awesome! We're here at Truro Church in Fairfax and the church is packed with very joyful people. The new Anglican Church of North America (ACNA) diocese enters the ACNA as the largest diocese. It spans the area of North Carolina, Virginia, Maryland, and Washington, D.C.
Last May, the Anglican District of Virginia (ADV) Synod elected the Rt. Rev'd John Guernsey as the bishop of the proposed ACNA Diocese of the Mid-Atlantic. In June, the ACNA's Provincial Council affirmed the creation of the Diocese of the Mid-Atlantic. Bishop John Guernsey who had been overseeing the congregations that had separated from The Episcopal Church and moved under the jurisdiction of the Anglican Church of Uganda before transitioning directly to the ACNA, was confirmed as the first diocesan bishop by the ACNA College of Bishops in June. Bishop Guernsey was the rector of All Saints, Dale City, VA. All Saints separated from the Episcopal Diocese of Virginia in the spring of 2006 in an amicable settlement that permitted them to remain in their property until the completion of the building of a new church. The settlement had been meant to be a prototype for the other congregations to follow in the development of the Diocese of Virginia's Protocol for Departing Congregations. The protocol was abruptly abandoned by the Diocese following the installment of Katharine Jefferts Schori as the Presiding Bishop of the Episcopal Church, about six months after All Saints left the Episcopal Church. All Saints will be officially moving into their new church later this month and will also serve as the office for the Diocese of the Mid-Atlantic. John Guernsey at 2003 General Convention. Prior to his consecration as a bishop in 2007 by Ugandan Archbishop Henry Luke Orombi (who also incidentally consecrated the Rt. Rev'd Sandy Millar, former rector of Holy Trinity Brompton in London) Bishop Guernsey served in leadership posts in the Diocese of Virginia, serving as a Deputy to six General Conventions where he served in different posts including chairman of the Evangelism Committee. I first met John Guernsey at the 1994 General Convention in Indianapolis, working closely with IRD President Diane Knippers and Pittsburgh General Convention Deputy Jim Simons. I remember at the Philadelphia General Convention in 1997 I testified at the Evangelism Committee that John was chairing on a resolution that was calling for a doctrinal change on the trinity. I read the resolution and recognized that, as a former member of the Christian Science Church, the new doctrine would have been quite at home in Christian Science. In my testimony I pointed out the similarities between the new doctrinal change and Christian Science and wondered why I had gone through all the trouble of "kneeling before my bishop to become an Episcopalian" only to find myself back in Christian Science right in the Episcopal Church! Why should I have left in the first place? I also remember going back to my seat when a rather moderate bishop sitting across the aisle from me leaned over and said that he too grew up in Christian Science and appreciated the point. I was still trying to get my heart from stop beating so fiercely, I had been so nervous and close to terrified and the affirmation from an unexpected quarter brought me great relief. I was very grateful to John Guernsey for the opportunity to speak at General Convention. Of course, I had no idea then that it was only the beginning. This is a historic moment for Anglicanism … throughout the globe. We represent not a little of that in our own persons in this place. This is also an amazing personal moment. The fulfilment of God’s plan for three leaders. John and Martyn and I were candidates for bishop (NOTE: for the Diocese of Colorado) and it was during that time that they formed friendships that continue to this day. Twenty-one years later I stand here as an Archbishop, Martyn now resides in the U.K. as Executive Secretary for the Global Anglican Future Conference Movement and the Fellowship of Confessing Anglicans and John here as the first bishop of this diocese. This diocese represents such a maturing in such a short time of this movement, but as it comes together – it’s the largest diocese in the movement at its birth. That is because of God’s favor and because of the faithfulness of all of you who stood in these days, who stood shoulder to shoulder not just those who are ordained but very much shoulder with the laity in this region. Bishop John Guernsey becomes the bishop of the new diocese. It is very moving to look over and see faces of many folks who have walked this long journey for the past five years and for many even more years. It is not clear yet if we will be displaced from our church homes as litigation continues between the churches that voted to separate from the Diocese of Virginia under the Protocol for Departing Congregations and The Episcopal Church and the Diocese of Virginia. The second round of briefs are due next week, followed by a third round in October. In November or early December there will be one more opportunity for oral arguments when the Fairfax County Circuit Court Judge Randy Bellows will present his questions to the Episcopal and Virginia churches' counsels. Some time after that that one-day oral Q&A, the judge will release his opinion. Kevin Kallsen from Anglican TV is present and once he has his video of the installation up I will post it here. I ran into old friend now Bishop Neil Lebhar who was serving communion. He is a former Associate Rector of Truro and now bishop for the ACNA's diocese that includes Florida. Years ago when he was still at Truro he was in charge of the Truro Young Adults. I was in my mid 20's back then and I remember asking exactly how did you know if you were a young adult? Neil said "Anyone younger than me." In fact, it is exciting to look out and see the young church planters and new leadership rising up, all ready building and rebuilding on the foundations not just of recent years - but on the foundation of those Anglicans who sailed to the Virginia shores four hundred years ago. As those early settlers experienced their own triumphs and great challenges, this new diocese will know such a story as well. What will this next chapter in our lives together bring? How will we discern what should change and what should remain? How will we stand firm for the Gospel of Jesus while making peace with our neighbors? One way comes to mind, which I think was overflowing today and that is in gratitude. Whatever happens, may we be grateful. There is so much to be grateful for, so much. Hey, stupid question from a relative newcomer... both the Archbishop and Tory Baucum made reference several times to what I'm guessing was an election to Bishop back in 1990 or so that Bishop Guernsey lost? I've been googling it, and can't seem to figure out what the deal is ... just trying to understand the reference. It was for the Episcopal Diocese of Colorado in about 1990 to replace Bishop Bill Frey who left Colorado to take the helm of Trinity Episcopal School for Ministry (TESM) in Ambridge, PA. Since when did B.D. begin to wear a zucchetto? Actually, that caught my attention as well. I did ask one of his staff members about that, but I really don't know why he decided to put that on instead of a miter. I admit I was a bit - well, I didn't think it was appropriate to wear in Virginia. It did strike me as odd. The only thing I could think of is that it had something to do with building relationships with other bishops who were either present or would see pictures (it is actually a bit of a miracle that Anglo Catholics and evangelicals have come together to form the ACNA). But I really don't know. All I can say is that I think it was a first! Interesting question about the zucchetto. +Bob has been wearing it for some time here in Pittsburgh. He mainly wears it in Anglo Catholic parishes. He tends to respect the churchmanship of the parish he is visiting and dresses and acts accordingly. As pastor of an charismatic evangelical parish I can say +Bob has entered in to the way we worship with grace and joy -- to the benefit of us all. It's never about him -- with +Bob, it's Jesus, All for Jesus. I forgot to add, I first met John at GC1991 in Phoenix. I was a lay convention deputy from Pittsburgh and assigned to the Evangelism Committee and he was the Committee Chairman for the first time. It was a great experience for me. As for those you worked with at GC1994 - John is now your Bishop, Diane Knippers is home with the Lord and Jim Simons presides over his masterpiece, the heterodox TEC-Pgh Diocese. Sounds to me like you are a Bob Duncam fan: Bob Duncan can do no wrong in your eyes. Whatever he may do in his own diocese, it is increasingly evident to those outside his diocese that Duncan has particular leanings in theology and churchmanship. Wearing a zuchetto in the former Anglican District of Virginia is further evidence of those leanings as is his anointing of Foley Beach's head at his consecration, a practice the English Reformers rejected, and his support of the new ACNA ordinal, which sanctions beliefs and practices that they also rejected. It is also evident to outsiders that the Anglican Church in North America under his leadership is moving away from GAFCON, The Jerusalem Declaration, and their call to return to the classical formularies and historic Anglicanism. I have known Bob Duncan since the day he interviewed to be Canon to the Ordinary in 1991. He is an evangelical-catholic Anglican and I am a evangelical-protestant Anglican. I don't agree with our Bishop on some things and he doesn't agree with me on some things. He has done some things wrong and he readily admits it. And I have told him so when I beleive so. That being said, he loves and respects me and I love and respect him. He has never let churchmanship differences become issues and has always deferred to the others wishes. I would bet the farm if Bishop Guernsey had asked him not to wear the zucchetto, he would not have worn it. May be more folks need to be calling upon Bob Duncan to heed the call of GAFCON and The Jerusalem Declaration to return to the classical formularies and historic Anglicanism. He is clearly not leading the Anglican Church in that direction. I do not believe that he is like the abbe whom a bystander stopped to ask why he was chasing a mob, only to receive the breathless reply, "I'm their leader!" He chaired the roundtable that adopted the theological statement from which the ACNA fundamental declarations were taken. He oversaw the drafting and eventual adoption and ratification ACNA constitution and canons. All three documents have a decidely Anglo-Catholic bias. The ACNA canons incorporate doctrine, language, norms, and principles from the Rwandan canons that in turn are taken from the Roman Catholic Church's Code of Canon Law. This past summer I completed an indepth study of the Rwandan canons. If you have not read the Rwandan canons, they make bishops the only legislator in their dioceses and give diocesan synods a purely consultative role as in the Roman Catholic Church. They also affirm the dogmas of the Council of Trent. They are the work of an AMiA priest, a former Roman Catholic, who is not known for his support of The Jerusalem Declaration. Bob Duncan has rather flagrantly ignored the provisions of the ACNA canons. He appears to see them as a mandate to do what he thinks right in his own eyes. He is not contributing to the establishment of a healthy ecclesiastical culture in the ACNA. Since he is your ordinary, I understand that you are not in a position to discuss his shortcomings and weaknesses online. But I think that you need to know that there are folks who are concerned about the direction in which the ACNA is going under his leadership. I do think it's important to remember that the ACNA is doing amazing work bringing together two major wings of what was The Episcopal Church, the evangelicals and the Anglo Catholics. We cannot take this lightly or take it for granted, and I do encourage us all to continue to pray and in ways in which build up the body of Christ, express opinions, but also be careful to not get the ax out and start hacking at the boat. Some have gotten out of the boat and gotten into another one - AMiA for example. They are still in the flotilla, make no mistake about it, but for their own conscience they have gotten into different boats on our Anglican journey. The ACNA is rather miraculous when we know a bit of the history of the evangelical and Anglo Catholic movements in the Episcopal Church. I do trust Bob Duncan and so while I might not have advised him to wear a zucchetto in Virginia, I trust that he had a very good reason to do so. We are allowed to be human and to give each other space to be human, even to express our own particular streams of Anglicanism. But I do know that the structures for the new diocese respect the traditions and forms of Anglicanism founded in Virginia and John Guernsey very much knows and understands the evangelical or low church traditions. At the same time he is also very respectful of our other biblical expressions. I have seen him at the helm in some mighty turbulent waters at past General Conventions and show remarkable leadership as we see old wounds heal between brothers and sisters in Christ. The example gives one hope that perhaps on day we may find such healing in other parts of our communion as we turn our eyes on to Jesus. For your sake, I hope that your trust is not misplaced. 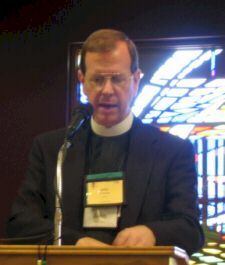 I discern forces at work in the ACNA and its ministry partner, the AMiA, that contributed to the fragmentation of the Continuing Anglican movement in the 1970s and 1980s, and I note a reluctance or unwillingness to recognize the existence of these forces, much less the effects they are having and will have upon the two ecclesial bodies. I see clear differences between theological outlook of the Fellowship of Confessing Anglicans outside of North America and the theological outlook of the ACNA and the AMiA. As you know, the Fellowship of Confessing Anglicans is the term that the participants in the 2008 Global Anglican Future Conference (GAFCON) used to describe themselves. Their theological outlook is reflected in The Jeruslem Declaration and the two documents The Way, the Truth, and the Life and Being Faithful: The Shape of Historic Anglicanism Today. Consequently, I do not share your optimistic appraisal of the ACNA. Before St. Louis, the traditionalist Episcopalians that would form the Continuum had a similar view of the original ACNA but their hopes never came to fruition. Unacknowledged differences in theology, churchmanship, and vision would tear the new church apart. The lessons of the continuing Anglican movement is that - with the great exception of the Methodists - is that breakoffs basically turn into tiny little sects and do not grow. The FCA and the ACNA are both very active participants in GAFCON. One of the major differences between this movement, I believe, and the "continuing Anglicans" of the 70s and 80s has been the welcoming of both Anglo Catholics and Evangelicals. It is not easy and while a robust conversation is healthy (certainly we had that in the formation of the constitution and canons for the new Diocese of the Mid-Atlantic), may we also recognize that our coming together is truly a gift. At the end of the day, our commitment to evangelism, of reaching out beyond ourselves to our local communities is perhaps one of the most challenging tasks we have. The ACNA may be an active participant in GAFCON but the proponderance of evidence points to a large segment of the ACNA not really supporting GAFCON and certainly not upholding the doctrinal positions of The Jerusalem Declaration. The differences between the ACNA Fundamental Declarations and The Jerusalem Declaration are not simply a matter of differences of language and emphasis. There are substantive differences. The coalition between Anglo-Catholics and "evangelicals" is likely to hold together as long as the "evangelicals" cater to the Anglo-Catholics and the Anglo-Catholics are persuaded that they can move the ACNA in a more Catholic direction. One of the main reasons for the fragmentation of the original ACNA was that the Anglo-Catholic traditionalists sought to make that body more Catholic in doctrine, order, and practice. The St. Louis Declaration sought to accomodate them but they were not satisfied. The new ACNA is likely to hold together as long as the other groups in that body accomodate the Anglo-Catholic wing. However, they do so at the expense of their own theological integrity and at the expense of the classical Anglican formularies and historic Anglicanism to which GAFCON and The Jerusalem Declaration calls the global Anglican to return and reaffirm. At the heart of evangelism is the proclamation of the New Testament gospel and the making of disciplines. ACNA churches are going to accomplish little in the area of evangelism if there is no agreement upon the gospel and the clergy of one church preach one gospel and the clergy of another church preach a different gospel. This is the case in the ACNA today because the groups forming the ACNA do not share a common understanding of the gospel. The Scriptures recognize only one true gospel. The English Reformers sought to safeguard the truth of the gospel with the Thirty-Nine Articles. In the ACNA you have groups that interpret the Articles in their plain, natural, and intended sense, groups that reinterpret in a Roman direction, and groups that dismiss the Articles as a relic of the past. In other words, you have theological pluralism. It may not be as extreme or as radical as in TEC, but it is present and it affects primary matters, not secondary ones. Hi Kyrkliga, thank you so much for your comment. The reason you didn't see the laying on of hands for Bishop Guernsey is that he is all ready a consecrated bishop. He was consecrated a bishop for former Episcopal congregations affiliated at that time with the Anglican province of Uganda by the Rt. Rev'd Henry Orombi. When the ACNA was established, Archbishop Orombi transferred oversight for those congregations into Bishop Guernsey's care as the Diocese of the Holy Spirit. With this election, the remaining congregations in the Diocese of the Holy Spirit will form new geographical dioceses or join all ready established dioceses in the ACNA. This service last weekend did not include a consecration but rather was a formal installation of a diocesan bishop. P.S. Bishop Guernsey was consecrated a bishop in 2007. In the 1949 Book of Offices and the 1991 Book of Occasional Prayers the presiding bishop does not take the right hand of the bishop whom he is installing nor does he lay his hand on the bishop's shoulder. I only found the ceremony of taking the right hand of the incumbent in a service of installation of a new minister to his cure not a new bishop to his diocese. It was in the 1926 Irish Prayer Book. The bishop takes the right hand of the incumbent while instituting him. The bishop then blesses the newly-instituted minister. Archbishop Duncan was in Bishop Gurnsey's case using ceremonies associated with the installation of a new minister to his cure instead of a new bishop to his diocese. Laying his hand on Bishop Guernsey's shoulder was presumably a gesture of blessing. Apparently whoever put together the installation service did not do his homework. Considering the new ACNA ordinal departs significntly from the classical Anglican ordinal, I am not surprised. Both Archbishop Duncan and Bishop Harvey, Primate and Dean of the Province, were wearing zucchettos, a decided Anglo-Catholic touch. This coupled with the ceremony noted above points to a particular view of the office of Archbishop that is not supported by the ACNA governing documents but which Archbishop Duncan appears to be seeking make the official view of his office by other means.